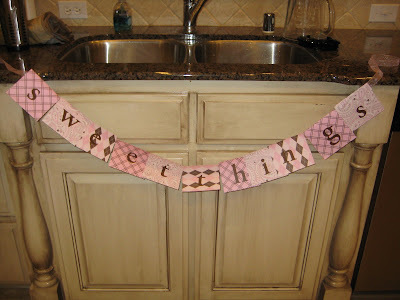 And this sign to hang on the table or above it - it says "sweet things"
I'm sure I'll take lots of pictures and make a post tonight about the shower! What a great idea. The cookies and sign are adorable. YUM-O!!!!!!!!!!!!!!!!!! Looks delicious! You always host the best showers and parties and dinners and everything else! Cute! Are those scrapbook papers? I am sure it will be a great party. 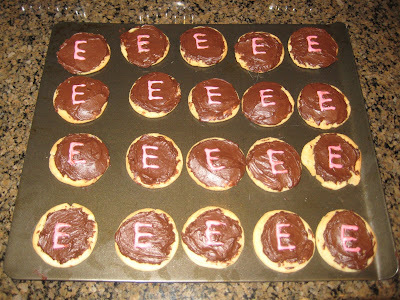 The cookies look very delish!! You are amazing... Love the pink and brown! Cannot wait to see more! Praying for you! I've recently started reading your blog, it's so inspriational. I love the shower decorations! That is precious! Know I'm thinking about you and praying too, Kelly! sounds like a delish theme...wish I had one of those cookies right now! Great idea! How neat that it ties in perfectly with her last name. So cute--I love pink and brown! I'm curious about the sign--is it scrapbook paper that you ran through the printer to do one letter on each? Cute idea! It all looks so cute! Is that scrapbook paper? I love the cabinets in your kitchen! Wow, so elegant!!! OK, I'm loving that "sweet" theme! :) Great job on the sign and cookies. Looking forward to more pics of all the shower cuteness. Those cookies look delicious and I'm loving the "Sweet" theme! What a fun last name!! what did you use to make the banner? I LOVE it and I am having a shower for my friend in a few weeks.